A simple but elegant recipe from my cookery guru, Yamuna Devi. 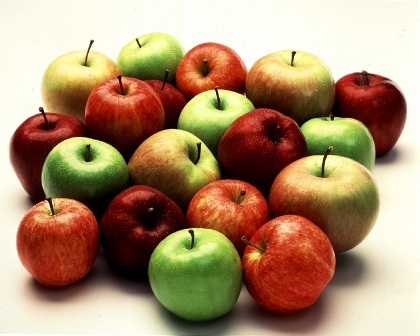 Yamuna Devi writes: “Outside of Kashmir, where most of India’s apples are grown, the texture of Indian apples tends to be mealy – a sure sign of over ripening due to long storage at warm temperatures. On the whole, I do not find them as good as most western varieties. Use any crisp salad or all-purpose apple: for example, Newton, pippin or McIntosh, which are crisp, sweet and juicy, with a tangy overtone; anything from sweet red or Golden Delicious to tart granny Smith will do as well. With the grapes and mint-almond dressing, this is an elegant mid-winter fruit kachambers“. ½ cup seedless grapes, halved. Blend the yogurt or sour cream, mint, almonds, cardamom seeds and orange or lemon juice in a mixing bowl. Fold in the apples and grapes, cover, and chill for at least ½ hour before serving.